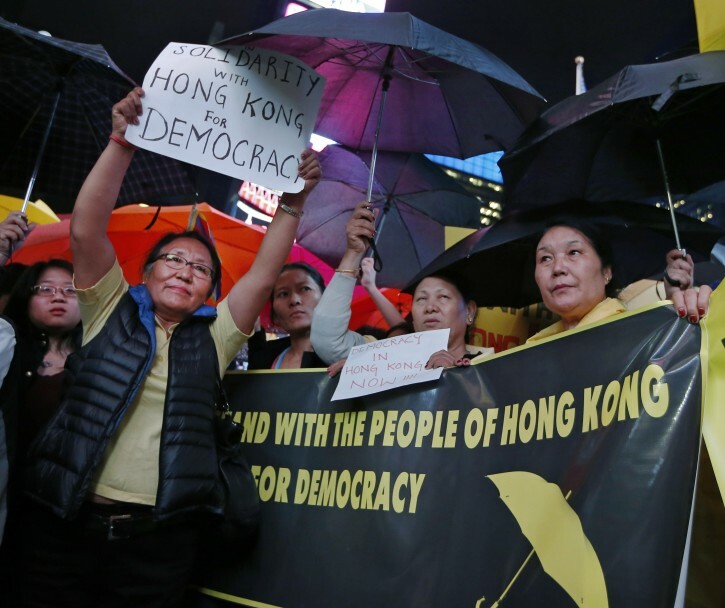 New York - Students bearing umbrellas as a sign of solidarity gathered at rallies in several U.S. cities on Wednesday to show support for pro-democracy protesters in Hong Kong. Altogether, hundreds were expected at Umbrella Revolution rallies in 40 U.S. cities, including New York, San Francisco, Boston and Chicago, organizers said. 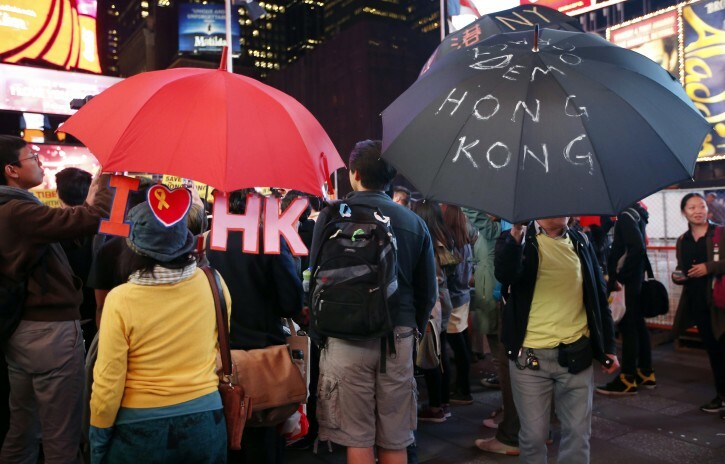 In New York, more than 100 students and supporters gathered in Times Square on Wednesday evening, many holding umbrellas, which have become symbols of the civil disobedience movement in Hong Kong, where protesters have used them to deflect police pepper spray. “Tonight, umbrellas are our weapon,” said Richard Tam, who’s from Hong Kong but lives in New York and works in the shipping industry. Tens of thousands of people have rallied in Hong Kong since last week. They’ve threatened to occupy key government buildings unless a top official resigns. The protesters oppose Beijing’s decision last month that candidates in the territory’s inaugural 2017 elections must be approved by a committee of mostly pro-Beijing local elites. The protesters see China as reneging on a promise that the chief executive will be chosen through universal suffrage. They are posing the stiffest challenge to Beijing’s authority since China took control of the former British colony in 1997. China’s communist government has condemned the student-led protests as illegal, though Beijing has left it up to local Hong Kong authorities to handle the demonstrations. Police fired tear gas and pepper spray over the weekend in an unsuccessful attempt to disperse the activists. More than 37,000 people signed onto a Facebook page encouraging participants to wear yellow on Wednesday in sympathy with Hong Kong protesters and listing dozens of universities where students would be participating, including Harvard, Yale, Brown and Michigan State.